After the initial production run of our 1/144 scale (10mm) Cold War 84 BTR-60PB we began having problems with the mould. Despite reworking the master the problems continued and we had to temporarily withdraw the model from our catalogue. As an alternative to casting in metal we looked at pressure casting in polyurethane resin – the results were superb, with a lovely crisp casting without the problems from our spin casting mould. 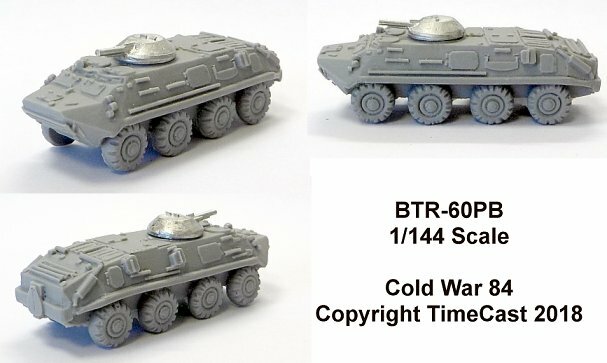 The BTR-60PB is now back in production, with a redesigned hull and more detail, with a pressure cast resin hull and a white metal turret. The model retails for GBP 4.00 or GPB 36.00 for a ten model company pack.